Today, I'm sharing a card I made for the Paper Crafts and Scrapbooking Gallery Idol 2014 contest. I'm pretty sure I enter every year with the exception of last year. I figured I would give it a go. I'm not having a ton of luck making time for crafting right now so maybe this is the push I need. What's the worst that could happen? I haven't made it any other year so fingers crossed. This year's audition theme is washi tape. I have a BUNCH of washi tape and I don't use very much of it, just a few pieces here and there. I figured I would go all out and use a whole bunch. I am not very good at making gradients so I thought I would try one with washi. I didn't have all the colors I needed so I layered a few of the tapes. I used a Memory Box die, a Paper Smooches sentiment, and some CTMH little rhinestones. 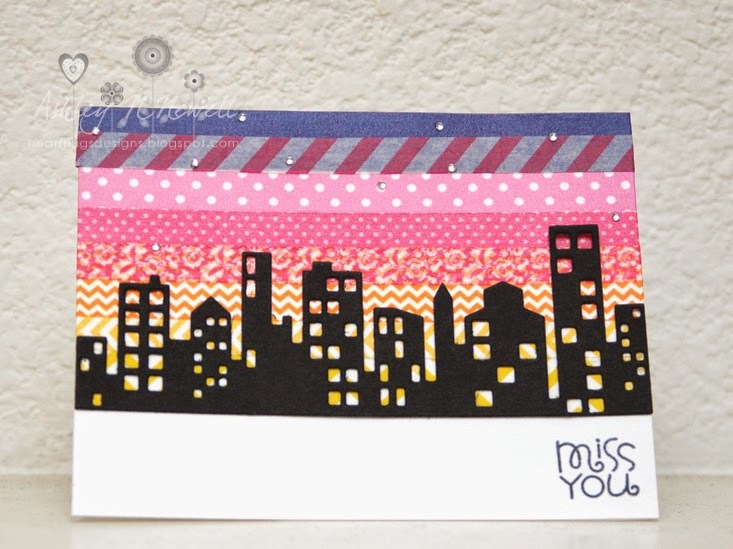 Love that you created the sky with washi and love that you threw your hat in the ring! Good luck!